About 10 years ago, a man called Giant started the Bartendaz fitness movement in the United States’ black-culture capital. Today, he’s spreading his message beyond Harlem and seeking to change more than your body. Most call 5-foot-7 Hassan Yasin-Bradley “Giant.” The name was born of being “the shortest guy with something really big to say.” At 44, Giant—and the Bartendaz group he founded—is known throughout Harlem, and he and his crew are known on the Internet for the impressive gymnastics skills they display. Three days a week, the Bartendaz are at a Harlem park practicing what they call the seven natural movements—push-ups, pull-ups, squats, lunges, jumps, dips and planks—in an explosive style more akin to an artistic performance than a workout. 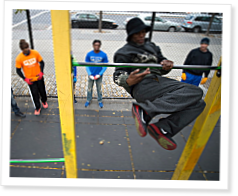 But Bartendaz is part of something bigger: It’s the fitness arm of nonprofit Giant Thinking. The organization melds fitness, martial arts, youth empowerment and elements of hip-hop culture to “push our youth and our communities to higher standards of physical, social and moral excellence,” according to the Bartendaz website. Giant tells children and adults alike not to focus on the “bling bling” but on the “think think,” and the awe-inspiring acrobatics are simply the bait on the hook. Using wooden plyometrics boxes, bumper plates and dumbbells, Sean Lind of CrossFit Gymnastics shows a progression for developing an L-sit press to handstand. Very inspirational man this Giant and what he do with his crew for others. Blow my mind ! "Physical strenght supports mental strenght" Giant.